This page may require cleanup to meet basic quality standards. The specific problem is: Check StarForce problems with Vista 64 bit. Add patches. You can help by modifying the article. The discussion page may contain useful suggestions. 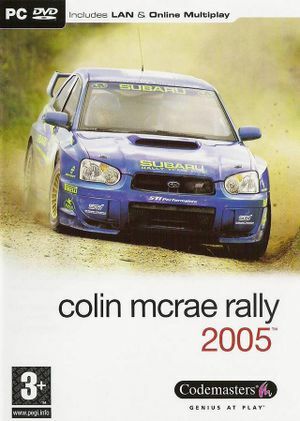 Released on OS X as Colin McRae Rally Mac. StarForce 3.4.49.1 DRM[Note 1]. Some Polish copies have no DRM. v1.1 Patch adds new features. 2x, 4x or 8x FSAA. Running the game in Windows XP (Service Pack 3) compatibility mode may help if it will not run normally. Go to the game shortcut properties. On the Compatibility tab, set compatibility mode to Windows XP (Service Pack 3). Click OK and try running the game again.